Have you ever had a tooth that was really sensitive to sweets? That could be the sign of a growing dental cavity. A dental cavity, which simply means the missing structure in a tooth, is caused by tooth decay. The scientific term for the tooth decaying infection is dental caries, and this decay process is caused by specific types of bacteria that produce acid that can destroy tooth structure. There are hundreds of types of bacteria that can live in the mouth; however, only a few of them have been actually linked to tooth decay. Dental caries is a multifactorial, transmissible oral disease caused by the complex interaction of certain bacteria in plaque with carbohydrates on the tooth surface over time. There are a number of risk factors that contribute to this disease process. If you have any questions about how to help prevent tooth decay, Dr. Street and his team would love to help answer them. Occasionally, if weakened tooth enamel (decalcified enamel) is identified before too much tooth structure is lost, then a dental cavity could possibly be avoided if certain oral hygiene habits are modified. However, if the decalcification increases and tooth structure is lost, then a dental filling would be necessary to get the tooth back into a healthy state. 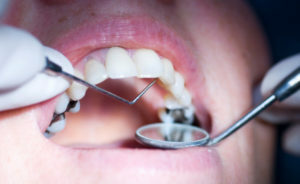 A dental filling procedure involves removing infected tooth structure and replacing it with restorative material to help restore function and esthetics to the once decayed tooth. Did you know that there are multiple options when it comes to the type of material used for a filling? The two main types of dental materials are composite fillings and amalgam fillings. Amalgam fillings (also known as “silver fillings”) have been around for over 175 years. They are a cost-effective solution for filling a cavity; these fillings are long-lasting and durable. However, many patients do not like the appearance of the metal in their mouths. Composite fillings (also known as “tooth colored fillings”) offer an esthetic component to the dental fillings. There is a wide variety of different composite shades to match the exact color of the patient’s tooth. Dental composites have been around since the late 1960s, but the material formulas have changed and improved significantly over the years. Dental composites mechanically bond better to the tooth, transfer less hot and cold sensations to the nerve of the tooth, and typically require less healthy tooth structure to be removed than with amalgam fillings. With the current dental composite formulas, Dr. Street believes that there are relatively few instances in which an amalgam filling would be recommended over a composite filling. If you have any questions regarding different types of dental fillings, Dr. Street would be happy to help answer them! Give us a call at (918) 488-9770 today!